Preschool/Pre-K - Hearts in Hand Child Development Center Hearts in Hand Child Development Center Your best source for quality childcare and preschool in Fort Collins. Our preschool program is designed to meet the needs of children ages 3-5. We have a class of Preschoolers ages 3-4 and a class of Pre-K ages 4-5. Low ratios of 1:8 are maintained in order to provide individualized learning and one-on-one attention throughout the day. We also have a half day class for mixed age of preschool 3-5 from 8:30-12 and 1-4:30. 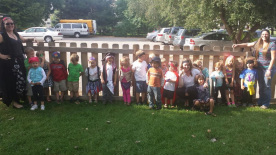 Our preschool program is theme based and includes all areas of development. The children are given free play opportunities inside to explore our learning centers and outside on our playground. Learning centers include music, science, dramatic play, reading, listening, computers, manipulatives, blocks, art and sensory tables. Structured activities and group times are planned throughout the day to introduce and expand theme related ideas. Children are given opportunities for reading, writing, math, science and social studies through our Superkids and Harcourt curriculum. Individual education goals are written for each child and activities are designed to meet those educational needs. Monthly calendars and lesson plans are sent home for parents to view. Preschool groups take educational and recreational field trips up to 1-4 times per month depending on the time of the year. Full day children rest midday on mats. Snacks are provided in the morning and afternoon. Lunch is provided for full day kids M, T, Th. Parents are responsible for providing sack lunch on Wednesday and Friday. Half day Preschool/Pre-K runs from 8:30-12 or 1-4:30 and does not include lunch.